She looks like the Joker in that picture. I'm starting to wonder if the traditional concept of a church can even be saved. Leave the church system. There are not many true Christians attending these synogues of satan anymore anyway. I called Joyce Meyers to ask for help for a family whos house had burned. I was told that I should contact my local church. I told the lady on the phone that I had just watched a program about how they helped people. She told me to go to a local church. I told her that on the program they didn't ask me to send my money to a "local church", they gave me their address. She hung up on me. Nothing but a scam this ministry! This reminds of Mac Brunson. He should attend to see how he can get more family members on the church dole. Dawg- have you heard mark Seagle? He is in Jax. What is your opinion of his sermons? I have heard of Mark Seagle, and have heard many of his sermons. He is one of my favorite preachers. That is because I'm amazed at week after week how he preaches absolutely nothing that makes any sense, or is tied to the real-world. It is simply amazing. Sometimes I think he is preaching in Mandarin Chinese (pun intended) because I have no clue what in the world he is talking about. I also agree that Most who attend "church" are not believers.The Bible says that few will find salvation. My experience as a christian and a life long active church goer, that often times the most devout and spiritually enlightened members are labeled as trouble makers because they will not always go with the flow of the estalblishment. Maybe it's like a meeting for salesmen, where you have the best salesmen, those who make the really big bucks, coming to tell the other salesmen exactly how they do it. Wolves like to travel in packs. This is nothing more than a pack meeting to feed off of the innocent sheep. Good job Tom, you finally posted something I actually agree with. My sister and her kids attend Celebration. I've always been concerned about them going there. Feel free to write another article. Any topic will do. 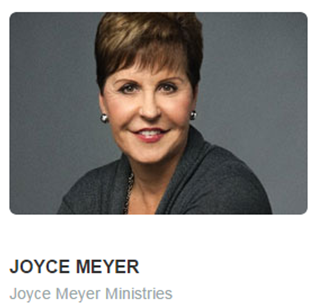 As a long-time member of Celebration Church, it is discouraging how you presented Joyce Meyer speaking. I am wondering how you arrived at your information for your blog post. 1) The cost for the 3 DAY EVENT was actually the total cost for a yearly conference for pastors and leaders to connect and hear from MANY gifted pastors & leaders from all over the US. It was not just a Joyce Meyer speaking engagement. She was only one of the speakers. 2) The cost you quoted was $129. The only people that paid that cost were the people that did not register before the cost went up. Just like any event, costs including food, etc.. has to be pre-ordered and planned for, just like a local fishing tournament or other event. Those that are last minute arrivals and walkups, they might have paid the $129. Most that pre-registered were $79-$99. And again, that was for ALL 3 DAYS!! 3) I understand your disdain for the prosperity gospel, Celebration Church, etc.... It would be nice for you to acknowledge some of the things that you appreciate and agree with, like the many outreaches to the special needs community, homeless outreaches, numerous overseas missions, and local monthly youth and parent outreaches that are making a difference in our community. In a short response here, I will probably never convince any of your readers or you to see things any differently. I only pray that you will be fairer in your future posts. I feel you made this specific post way more than it was. I used to attend Celebration a few years ago and did enjoy it at the time. What made me change was their sermons started to sound more like motivational speeches than Sermons. Also, I noticed that many of my friends had left and attended other churches. The last time I went was to hang out with a few friends, and it took all of my self-control not to just get up and leave. I am glad that I left Celebration Church, because of the congregation doing the "Harlem Shake" as if they were out in the world instead of at church. Wondering why my post I made about 2 weeks ago never showed up? It was a responible questioning about this post. Did you not approve it? I even gave you my real name, unlike most posts. What gives? As a long-time member of Celebration Church, it is discouraging how you presented SATAN speaking. I am wondering how you arrived at your information for your blog post. 1) The cost for the 3 DAY EVENT was actually the total cost for a yearly conference for pastors and leaders to connect and hear from MANY gifted pastors & leaders from all over the US. It was not just a SATAN speaking engagement. SATAN was only one of the speakers. 3) I understand your disdain for SATANIC TEACHING, the prosperity gospel, Celebration Church, etc.... It would be nice for you to acknowledge some of the things that you appreciate and agree with, like the many outreaches to the special needs community, homeless outreaches, numerous overseas missions, and local monthly youth and parent outreaches that are making a difference in our community. If they are both proclaiming a false gospel (Meyer certainly does), then how is having Joyce Meyer speaking different than having Satan--the Devil himself--speaking? Really, how? Hi, my name is Brent Papineau. Do you mind telling me your name? Why make this about something it is not? My comments were in response to the poor research and writing that was in the article, not about anything else. You said "If they are...........". We can talk about both of our beliefs whether they are right or not, but we all know that will not change anyone's mind. I would suggest articles that address all types of false teachings, not just those on money and giving. I am sure that will bring more value to this blog than just warning people about your thoughts on money. But, then again, maybe that is all people REALLY care about. Lots to consider. I think I will just take my concerns to the only One who really knows the heart of every man. Are the dogs asleep? I know that I was...I had no idea that Floyd won the SBC presidency for a second year. I will add that I saw a undercover video of a guy in a gay bar where ALL of them admitted to being abused as a minor. Did further research in all the surveys research it averaged to about 43.5% of homosexuals admitted to abuse as a minor. WAKE up DOGS! Pseudonymous blogging has been around for a long time. Happy 4th of July. Have you abandoned this blog, or? No abandonment! Everything is still here available for reading!! And more to come.